Joshua Tree National Park is such an unexpectedly beautiful part of California, where the rugged landscape often feels more like a remote planet than a desert two hours drive east from Los Angeles. The best way to experience the park is to get out and explore it on your own two feet. Here are some of the best hikes in Joshua Tree, spanning all physical levels, from easy to difficult. Before we get into the top hikes in Joshua Tree, here are a few logistical things that are good to keep in mind before and while in the park. This national park was formed from the Mojave and Colorado deserts coming together, and is made up of around 800,000 acres of desert landscapes including, looming rock foundations, prickly cacti, and the namesake straight-out-of-a-Dr.-Seuss-book Joshua trees. There are three entrances: the West Entrance and the North Entrance off of Highway 62, and the South Entrance from the 168 exit off I-10. There are four visitors centers in Joshua Tree: Oasis, Joshua Tree, Cottonwood, and Black Rock, where you can learn more about specific hiking paths from the park rangers, and use the flush toilets and picnic tables. A seven-day vehicle pass is $30. 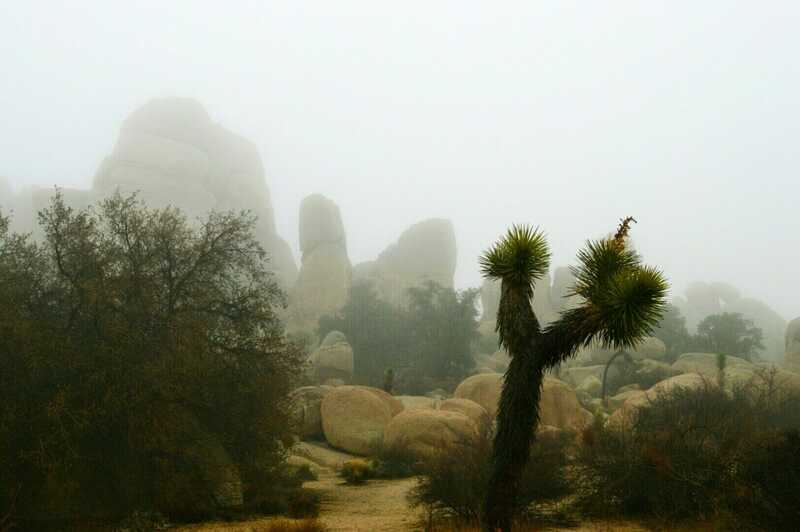 The weather in Joshua Tree can be intensely hot during the summer and it’s advised not to hike during the daytime. The best time during the summer is to hike before sunrise or around twilight or later (a full moon can make a great light source!). Spring and autumn are ideal seasons to go, since the heat is not as intense (though the park is much more crowded). The winter can also be a good time, though it can get cold and there’s increased rainfall during this time. As with any desert hike, it’s important to be prepared when you’re out on the trails. Most importantly, bring double the water you think you’ll need (at least two gallon of water per day to replenish body fluids). Potable water is only available in the Oasis Visitor Center, the West Entrance station, Black Rock Campground, Cottonwood Campground, and Indian Cove Ranger Station. Note that there’s no cell service in the park so make sure you have all your maps downloaded or go old school and pick up a paper map at a visitor center. To avoid the stress of finding parking at a trailhead, there’s the limited RoadRunner shuttle buses that are currently in their pilot phase, and though are closed down for the season, will run again in Spring 2019 free of charge. Flash foods can come on quickly and powerfully, so make sure to check the weather forecast right before you head out onto the trail. Be careful when encountering wildlife and respect their space, and watch where you step since venomous critters like rattlesnakes and scorpions call the park home. Some of the best hikes in Joshua Tree are the ones during sunrise or sunset. There are plenty of easy hikes for those who want to see the scenery, but are not up for an intense desert workout (I hear you). Most of these paths are flat, and have minimal elevation gain. A popular trail that takes hikers past the giant skull rock formation, whose eye sockets formed out of centuries of erosion from the rain. A valley sheltered by rock formations that was once thought to be used by folk who use to steal castle and store them conveniently in this secluded area. Close by to Hidden Valley trail, this dam provides a beautiful spot in the park to reflect, especially after the rains when the water level is high. Constructed by early cattle ranchers, this watering hole often attracts big horn sheep. Filled with Joshua trees, this trail takes you along the western ridge of the park to enjoy panoramic views from above. This brief path is a great spot to get a glimpse of a desert water source that was historically important for Native Americans, miners and cowboys in the area. Located close to the southern entrance of the park, this area used to be the location of several gold mines that were built near the Cottonwood Spring Oasis. There are several hiking options here, but the trail to Mastodon Peak allows you to see the Mastodon Mine and old Winona Mill Site. A trail that passes by the remains of one of the most successful mines in the area that produced both gold and silver. The estimate of the total bounty? 5 million dollars. Not too shabby for a desert mine. Hike amid barrel cacti as you make your way along a ridge, and then down into a rocky canyon that has a fan palm oasis at the bottom. A popular hike that takes you to the summit of the mountain, where stone steps help you make the ascent. The reward is at the top, with spectacular views of Joshua tree forests and impressive rock formations below. This strenuous hike rewards adventurous folk with a descent from a Joshua tree forest to the Wonderland of Rocks (large monzogranite rock formations) that are commonly found at the northern edge of the park. Trail info: 8-miles one way, hikers who make it all the way to the end are recommended to take the park’s vehicle shuttle back if available, starts at either Indian Cove backcountry board (north end) or the Boy Scout Trailhead (south end). Hike to the summit of this peak located on the Little San Bernardino Mountains, and enjoy the panoramic views of the quieter western part of Joshua Tree amid the Pinyon pines. Within the park itself there are nine campgrounds to stay at, where during the busy season of October through May, they are first-come, first-serve, except Black Rock and Indian Cove. During the quieter summer months, all campground grounds are first-come, first-serve. There are group sites where you can book a year in advance and can accommodate between 10-60 people. Most sites only allow tents, except for Indian Cove Group Campground, which allows small RVs. Through the park only has camping options, the nearby town of Joshua Tree has some good lodging options. Joshua Tree Inn & Motel-located a mere five miles from the park entrance, this hacienda-style inn has a lot of historical charm and each room has a patio to relax on after a long day of exploring. Spin and Margie’s Desert Hideaway-a family-owned spot that is filled with personality and hospitality, and boasts clean spacious rooms with kitchenettes to prepare a pack lunch for the trails. There are no grocery stores within the park, but there is a café at the Joshua Tree Visitor Center, where you can pick up boxed lunches. There are eight picnic areas within the park: Black Rock, Split Rock, Cottonwood, Hidden Valley, Indian Cove, Cap Rock, Live Oak, and Quail Springs. Pie For The People-outstanding pizzas at a spot located right outside the park’s west entrance. Royal Siam Thai Cuisine-a local favorite that’s perfect for a post-hike celebratory meal of green curry and pad see ew. The Natural Sisters Café-solid spot to grab a black bean burger and vegan peach pie for the road. Sam’s Indian Food and Pizza-for excellent mango curry and their addictive garlic onion naan. Joshua Tree Health Foods-conveniently located near the south entrance to the park, this local store is a great place to pick up healthy snacks and drinks before heading into the park. Joshua Tree Coffee Company-a great spot to pick up some strong morning fuel (try the vanilla latte) and sip in the outdoor courtyard. What are the best hiking trails in Joshua Tree in your opinion? I'm Julia, a food-loving, California-based writer that loves exploring my home state, and hopes to inspire you to do the same.